The creation of the opera-ballet Les Éléments has links with the courtly and musical politics of Paris. Louis XIV died in 1715, leaving as his successor a five-year old fragile child. One of the focuses of the Regency was to ensure that the young Louis XV would survive at least as long as it took for him to father a successor to the throne. Dance was seen as a suitable approach to both encourage his own development, and to show to others that he was capable of succeeding his long-lived father and, eventually, to do his bit for the future of the royal line. To this end, several ballets were commissioned, usually giving the King a moment to strut his stuff in front of the assembled courtiers. One such was Les Éléments, performed in 1721 in a small theatre constructed in the galleries of the Tuileries palace, a less intimidating space for the young boy than the Salle des Machines. It was later expanded and amended for more public performance in 1725, and was performed many times in the years after that. After a prologue depicting Chaos, Destiny calls for The Elements to appear, which they do in four successive sections. Water is set in Neptune’s palace; Air in the palace of Juno; Fire is set in the temple of Vesta; and Earth in the orchards of Pomona. 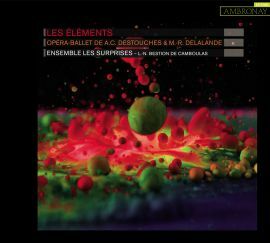 The musical politics explains why there are two composers linked to this work, André Cardinal Destouches and Michel-Richard Delalande. Delalande had achieved high posts in the court of Louis XIV, and wrote three of the little ballets for the new boy-king. But during the Regency, as seems to have been the practice, he began to pre-sell some of his posts to potential successors, once being Destouches, a composer who had already begun to make his mark under Louis XIV. How the two composers divided up the work is not known, as they worked under conditions of secrecy. But history has allotted much of the praise to the younger Destouches. Les Éléments marks a transitional stage in the development of the grand ballet héroïque of Rameau’s time. The work has been adapted as a ‘saloon’ piece by Louis-Noël Bestion de Camboulas, with 12 instrumentalists and three singers taking on the various roles: sopranos Élodie Fonnard and Eugénie Lefebvre, and baritone Etienne Bazola. The reduced instrumentation brings a lovely focus onto the solo characteristics of each instrument, with notable passages for flutes and recorders and oboe, and a wonderful overall clarity of sound. The singing from all three is excellent, with commendably fluid use of the distinctive French ornaments and with clear, focussed and relatively vibrato-light voices. The music is inspiring, with some wonderful moments of mood painting, including the depiction of the waves heaving and the winds driven by Aeolus’ terrible anger (track 7) and the Chorus of Vestals percussive depiction of the dread noise of terrifying night (track 24). The piece ends with a pastoral Shepherds chorus and a powerful Chaconne. Ensemble les Surprises was founded by gambist Juliette Guignard and keyboard player Louis-Noël Bestion de Camboulas. They have been resident as young artists at the Ambronay Cultural Centre. A video extract can be viewed here.